And Let Me Just Add… Carmen Miranda Has NOT Aged Well | Comics I Don't Understand - This site is now being updated daily at http://www.comicsidontunderstand.com. Please change your bookmark if necessary, and notify any web site with a link to the old address. Nicole: I get the joke here, what I don’t understand is why this guy doesn’t simply move over one or two seats. It is clear the theater is completely empty except for these two. The joke rests on the secondary joke here, which is a great deal funnier than the primary joke. The man didn’t notice the hat because so far all that’s shown up on the screen are badly animated moving food images meant to whet his appetite–and her fruity hat fits right in. I’m guessing the actual joke is the woman just sat down right in front of the guy who was already sitting down first. 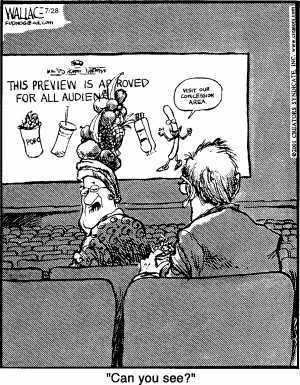 This has happened to me MANY times; I’ll knock off to a dollar matinee when I’m by myself, thinking I’ll get to enjoy the show in an empty and SILENT theatre, then some bozos sit RIGHT in front of me, munching & chatting through the whole picture. Of course I change seats, but then I’m no longer in the position I wanted in the first place. I would think that Carmen Miranda would have been able to afford her own private screening room. It’s a compound joke, obviously. There are several unusual events involved. 1. The woman (??) decides to sit down right in front of the only other patron in the theater. 2. Said woman is wearing a large Carmen Miranda hat. 3. Contrary to what you’d expect, she actually turns around and asks if she’s blocking his view. 4. The theater is showing a general-audience preview of the concession stand. The disconnect between 1 and 3 is especially obvious. She shows consideration for him by asking if she’s in the way, but then again, she was insensitive enough to sit in front of him in the first place. Of course, the reality is that she’s deliberately getting his goat. She was just be pretending to be considerate, and in a second she’s going to turn back around and completely ignore him for the rest of the evening. In my movie going experience, the “concession advertisement” and a movie trailer previewing a movie are two separate things.